Who doesn't want a "happy foot"? Make like a Fun Lovin' Criminal and try out the guitarist's quirky wah pedal technique. 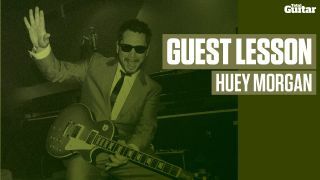 Check out the video above to watch Huey's guest lesson for Total Guitar issue 214 (on sale 15 April to 12 May) and pick up the mag for for the accompanying tab and explanation.